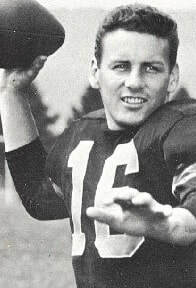 Len Dawson started his career in organized athletics as a nine-year-old infielder with the Goat Hill Midgets – the youngest player ever to pay in the Hot Stove’s D League. As a high school senior, he was still a baseball standout, hitting .400. But along the way he had also discovered football and basketball. Completing 100 passes for 1,638 yards and 19 touchdowns in 1952, Dawson was Stark County’s Most Valuable Player, a unanimous All-Ohio first team choice and the International News Service’s Outstanding Back of the Year in Ohio. He set a school record of 344 points in the 1952-1953 basketball season and was All-Ohio first team – the first grid-cage double since 1940. Dawson played one season of varsity basketball at Purdue University where football finally claimed his full attention. He threw four touchdown passes in his collegiate debut against Missouri, set a host of records, and did the punting and placekicking. As a sophomore he led the nation in touchdown passes; for three seasons he was the Big Ten passing and total offense leader. He was named to All-American and All-Big Ten teams, including those for scholar-athletes. Dawson combines his pro grid career with being a television sports-caster.